Recreate the opening scene from Toy Story 3! 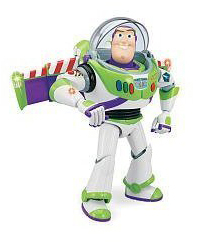 12" Buzz Lightyear figure includes the cool rocket pack, with afterburner jet lights & sounds! Buzz Lightyear also comes with laser arm lights, movie phrases, retractable helmet and is fully articulated. A super fun Buzz Lightyear from Mattel! Want a great Xmas toy where they are the hero instead? Take a look at the Armouron Action Set on our top toys for boys page.